A woman ( person #1) was excited about a formal event she was planning to attend, because it was the perfect occasion to show off the ruby ring she recently inherited from her grandmother. After signing in at the bank, she was ushered to her safe deposit box location by the courteous bank employee. To the woman’s horror, in place of her box number was an empty hole in the wall of boxes. Nearly hysterical she was reassured that there was a perfectly reasonable explanation. The explanation turned out to give life to the woman’s worst case scenario. Several months earlier, a different woman ( person #2) had entered the bank armed with her mother’s death certificate and the knowledge that her mother had rented a safe deposit box in that bank. The bank employees conducted their research, confirmed the death certificate and proceeded to have a locksmith drill out the box. The woman ( person #2) collected the contents and thanked the bank. The only problem was that the lock on the wrong box number was drilled. The woman’s ( person #2) mother’s box was located next to the one to which she was given access, which actually belonged to woman #1. All of person #1 cherished and valuable items were gone, including her heirloom ruby ring. When the bank was made aware of the mistake, all efforts were made to retrieve the “lost” property. The woman who had taken the contents told investigators that she had no idea that the contents of the box did not belong to her mother and had sold most of it. She gladly returned those items that remained in her possession. The ruby ring was not among the returned items. Seeking indemnity, person #1 exhausted all possible options and ended up filing suit against the bank. Sadly, this is not the only case of safe deposit boxes not being safe. In the past four years, there have been many cases where attorneys are retained in litigation cases with lost safe deposit contents as the central issue. In one case the bank was sold and the branch closed. All of the safe deposit boxes were moved to the new location. In the process, some were “misplaced”. In another case the theft of the safe deposit box contents involved a complex plot with bank employee complicity. The National Association of Unclaimed Property Administratorss says that while an average of $2.25 billion in unclaimed property was returned to rightful owners through state return programs during a Fiscal Year , there is still $41.7 billion waiting in those programs. Undocumented jewelry constitutes an unknown amount of that. 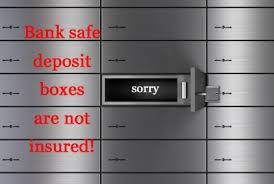 By and large safe deposit boxes are safe. They are not, however, 100% safe. Whether it be theft, error or acts of nature (i.e. Hurricanes Katrina and Sandy), your best defense is to keep an accurate and detailed inventory of the contents of your safe deposit box. Photographs are a must. Whenever possible, your jewelry , diamonds, gold & silver coins should be included in an appraisal report prepared by an accredited jewelry appraiser and kept in a separate, safe location. Chicago Gold Gallery provides written appraisals for your items and the fees will depend on the amount of items to be appraised and the detail required . It is also important to check with your insurance company to confirm that the valuables you have placed into a safe deposit box are covered. Some insurers offer a lower rate for these items. 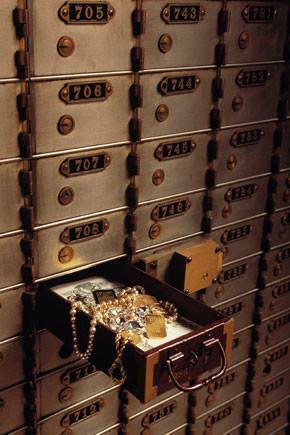 Many times safe deposit boxes are locked and left for years. I would suggest that at a minimum, a semi-annual visit to your safe deposit box be added to your calendar. Two basic long-term precautions are to give a second key to a trusted person, and to make sure your will mentions any contents of a safe deposit box and makes clear disposition of them.